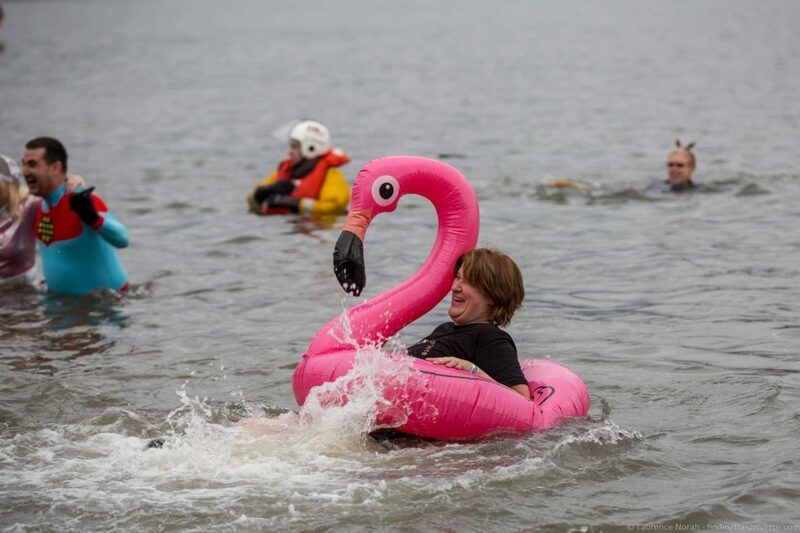 Home » Destinations » Europe » UK » Scotland » The Loony Dook 2020: Everything You Need To Know! 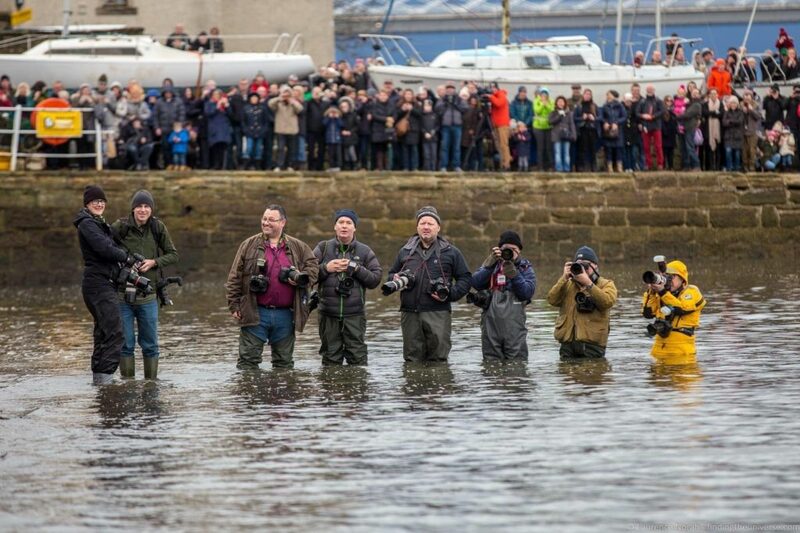 Not satisfied with an epic fireworks display, a massive street party and a torchlight procession to celebrate the new year (which they call Hogmanay), the folks of Scotland have also instituted an annual tradition known as the Loony Dook. 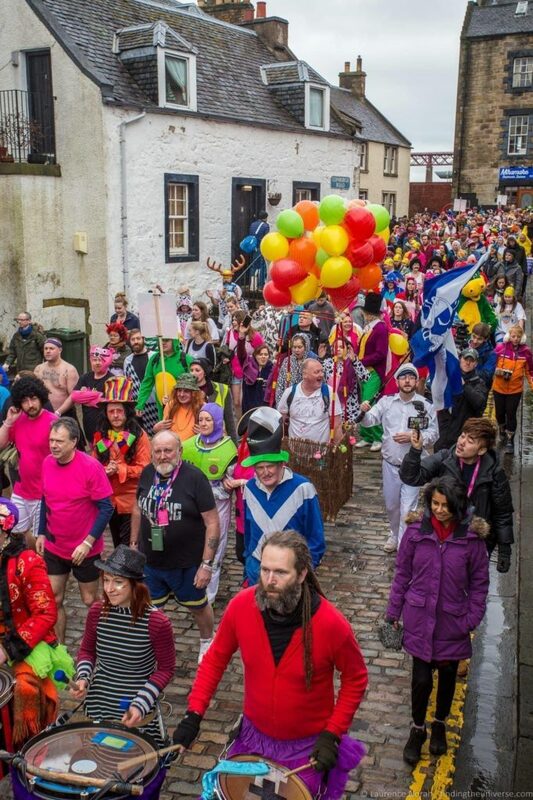 This involves getting yourself dressed up in the wackiest outfit you can find, marching through the streets of South Queensferry and then throwing yourself into the Firth of Forth. Which connects to the North Sea. Which tends not to be very warm. I have actually done this, and am delighted to have done so. Although I don’t feel the urge to do it again. In today’s post I’m going to do two things. 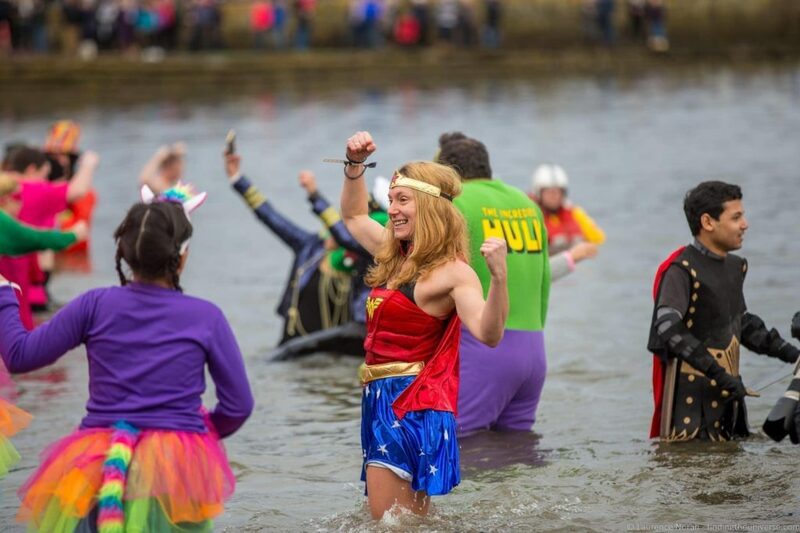 I’m going to share with you some photos of the madness that is the annual Loony Dook, and then I’m going to give you information should you wish to attend yourself – either as a spectator or as a participant. Let’s start with the photos, because they’re so much fun! 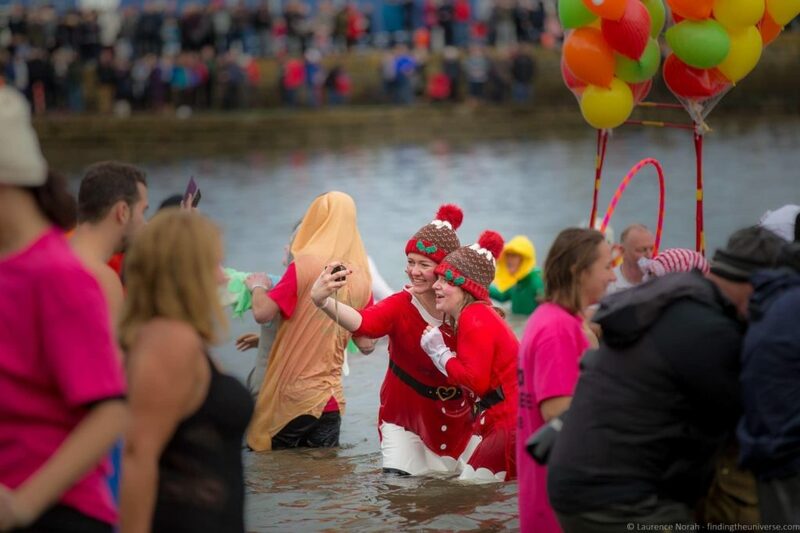 When is the Loony Dook 2020? 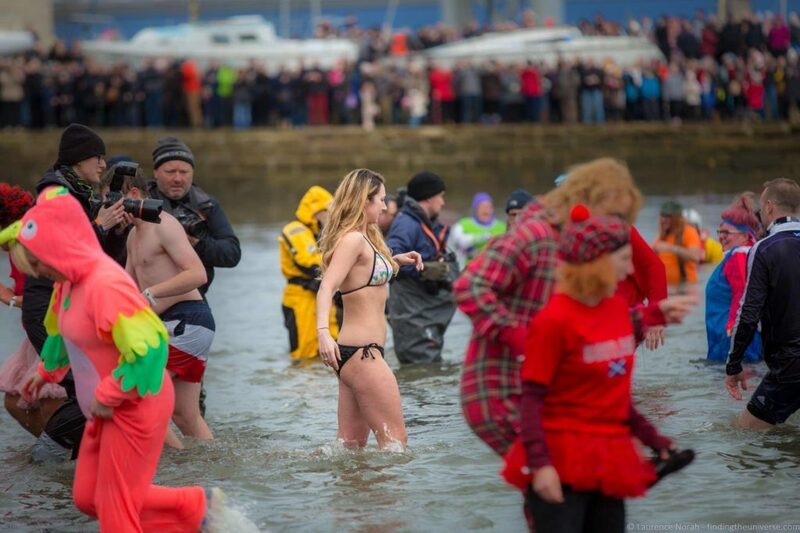 Can I attend the Loony Dook without going in the water? 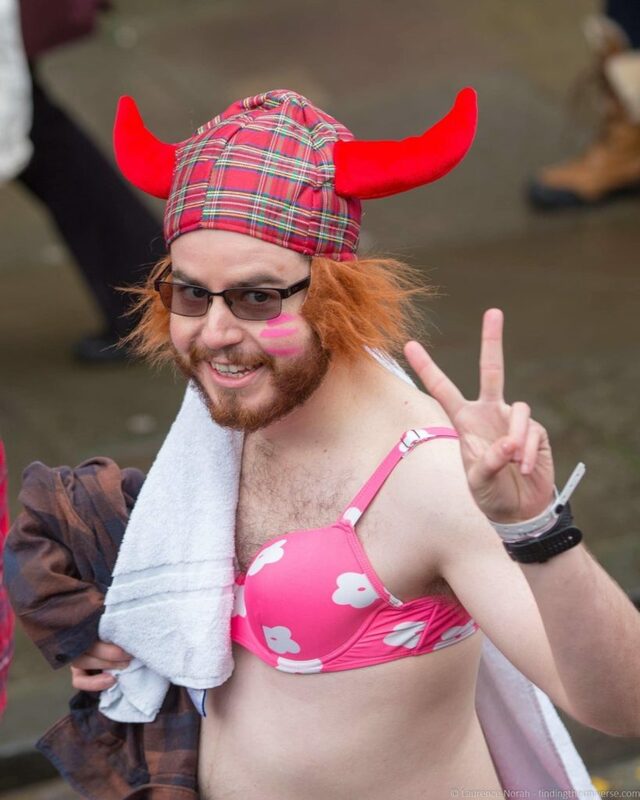 Do I need an outfit for the Loony Dook? 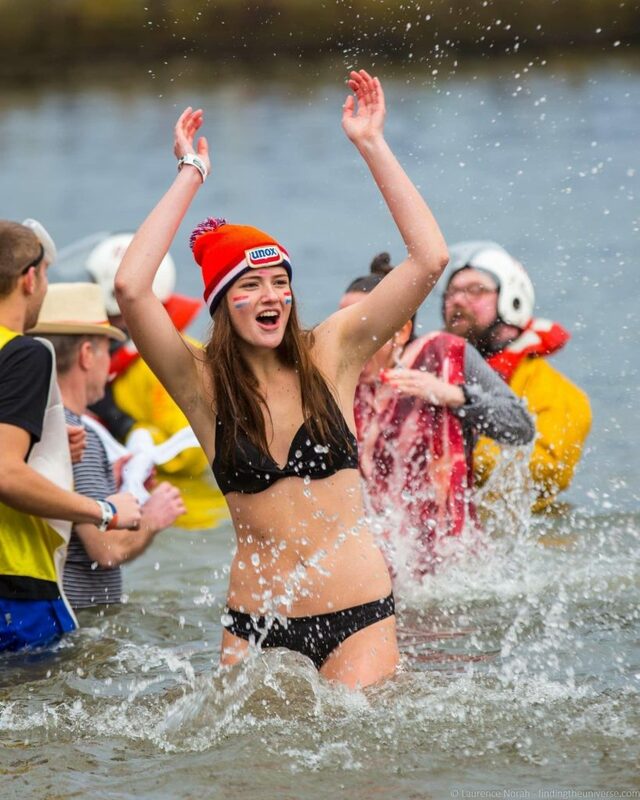 How many people participate in the Loony Dook? 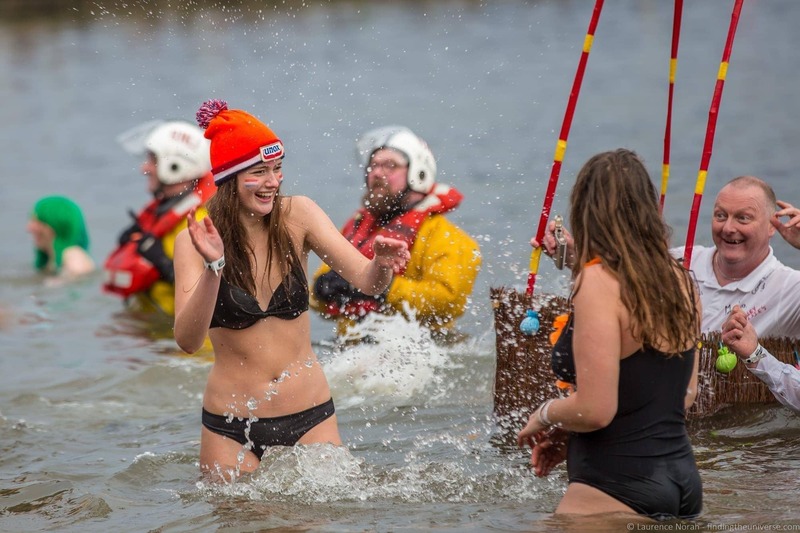 Is the Loony Dook safe? 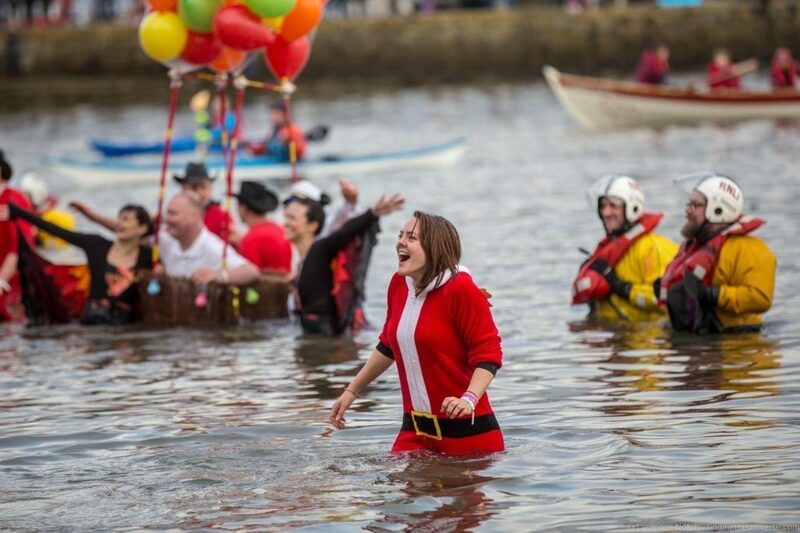 How do I get to the Loony Dook? 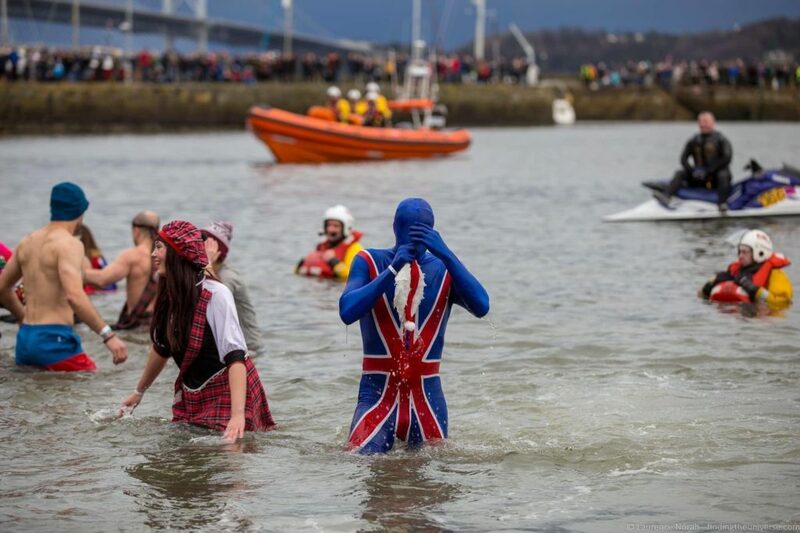 How Long Does the Loony Dook Last? 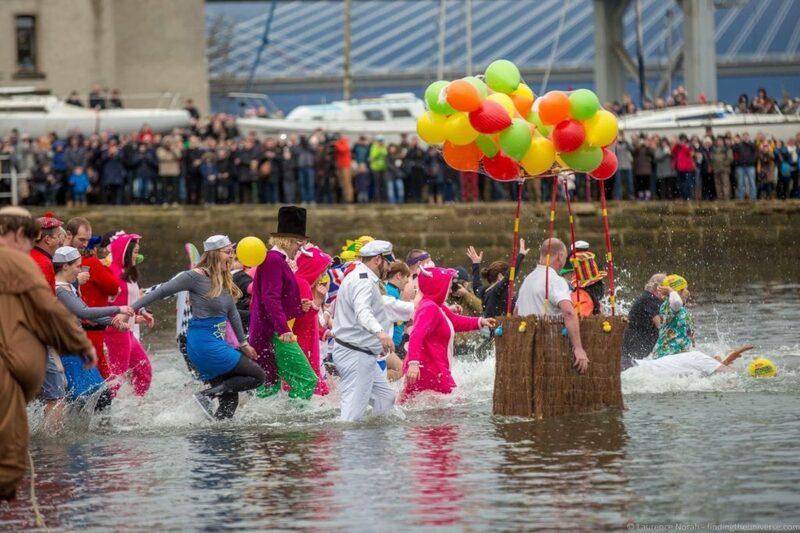 Where to Watch the Loony Dook from? 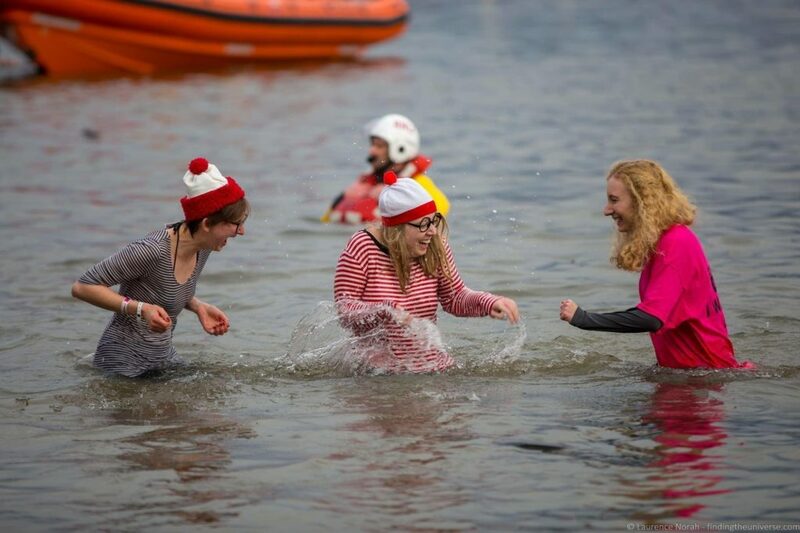 Any tips for taking part in the Loony Dook 2020? 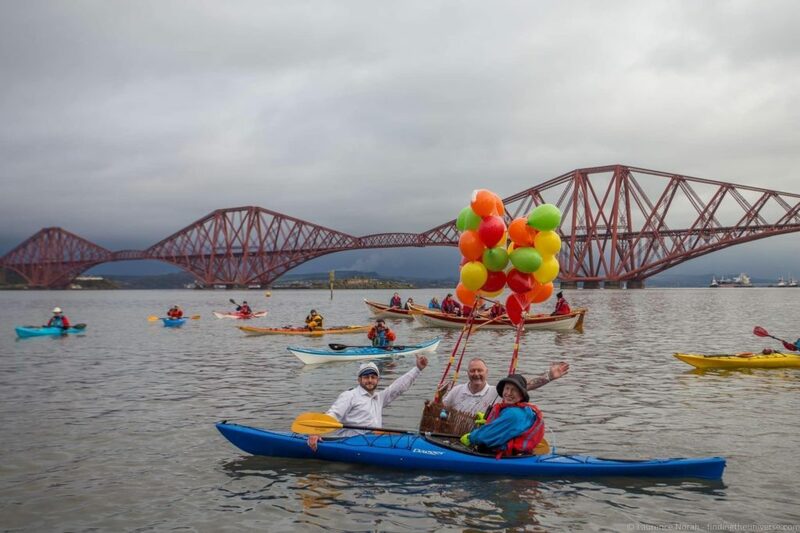 If you’re going to dress up as a bridge, make it the Forth Rail Bridge. Because even when dooking, you’ve got to have your tub of porridge ready. Dookers marching through South Queenferry, led by a drum band. The water is not as warm as this image makes out. We woke the spirit of Scotland. These folks came as photographers. 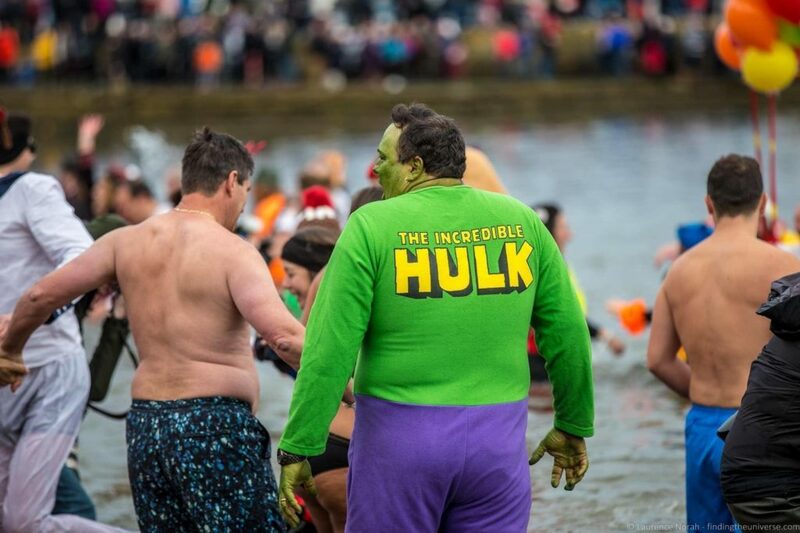 And that’s what the Edinburgh’s Hogmanay Loony Dook looks like! Now, to help you plan your own attendance at this fun event. If you want to attend as a participant, you have to register in advance. There is a small fee for registration, with £1 from every ticket going to the RNLI. The RNLI, or Royal National Lifeboat Institution, is a charity that saves lives at sea around the UK. Registration usually opens around September. When it opens, you’ll be able to buy tickets at the official website here. 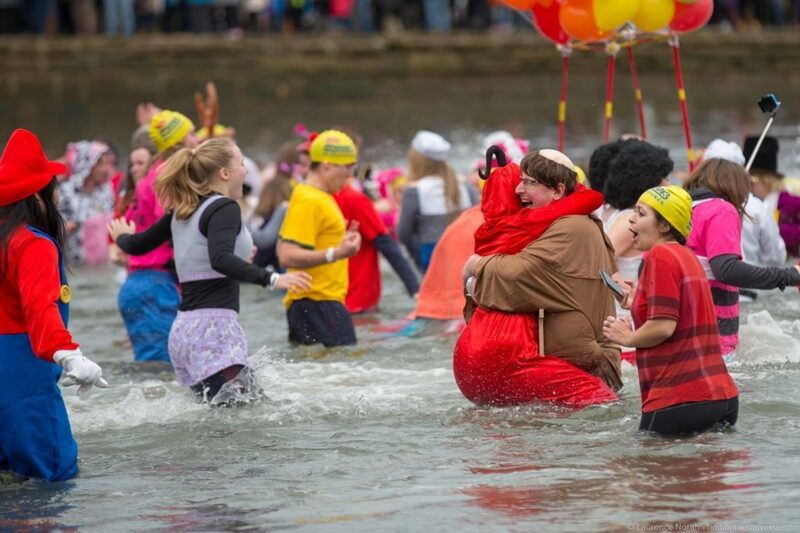 The 2020 Loony Dook will be held on January 1st 2020. 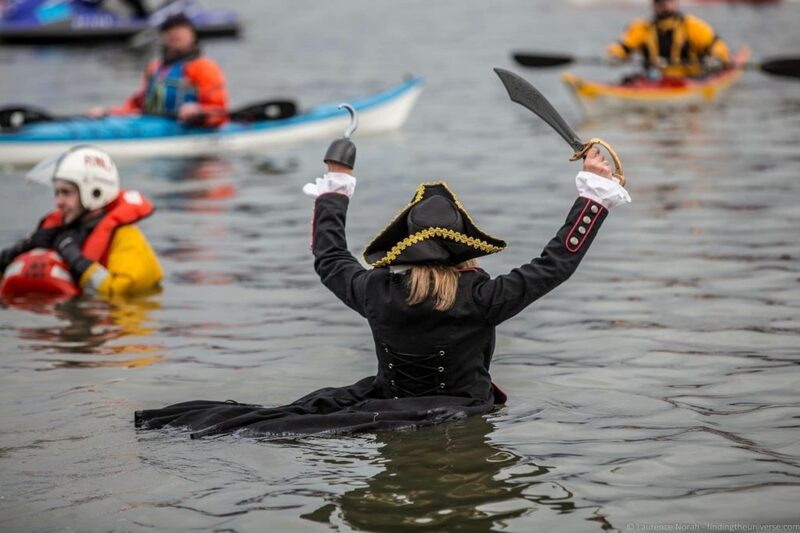 The official timing for the Loony Dook 2020 has not been announced, however it is based on the tide times, and we estimate it will likely be between 11.30am and 12.30pm. 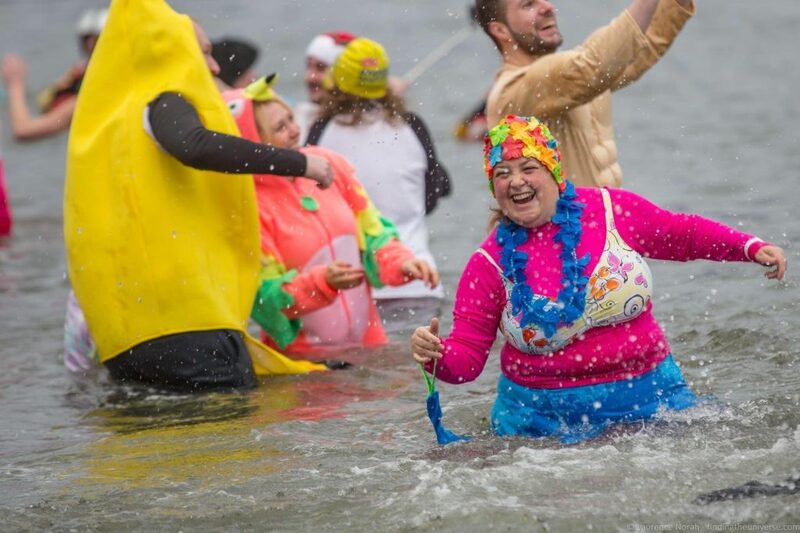 As a general rule if you are planning for future years, the Loony Dook takes place every year on the first day of the year (1st January). The time depends on the tide, but it usually takes place sometime in the morning when the tide is at its highest, which makes it a safer event. Absolutely! Hundreds of people attend each year as spectators. There is a very festive atmosphere and it is a lot of fun to watch and to cheer on the participants. It’s also totally free to attend as a spectator, and you don’t need to register. Just make sure you arrive well in advance, as you might have to walk a fair bit from your car if you drive. An outfit is not mandatory, but given how many people attend in fancy dress, you will probably enjoy your experience a lot more if you make a bit of effort. For 2019, a prize for the best outfit was awarded, with winners receiving £250 for a charity of their choice, as well as 2x tickets to any Underbelly show or event in 2019. We will update this post with information on the 2020 prize when it becomes available. 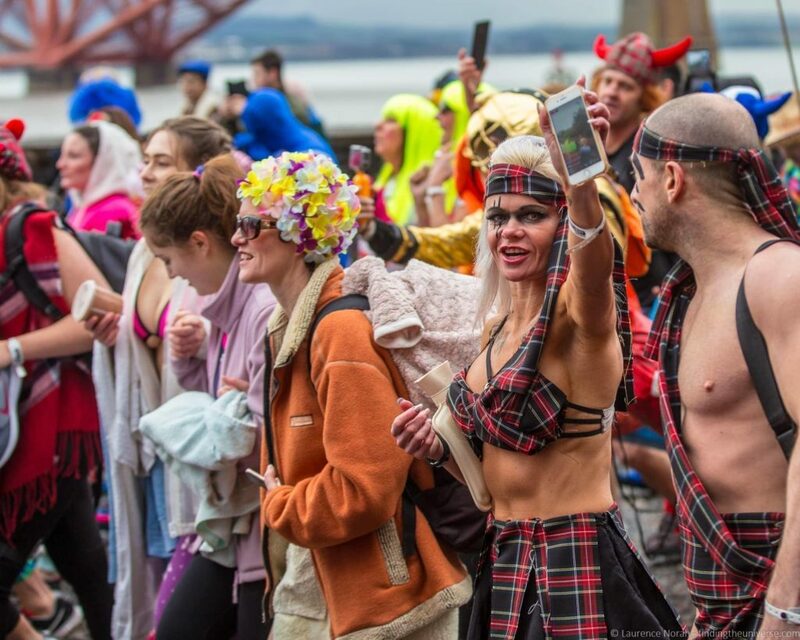 Normally around a thousand people take part in the actual “dook”, which starts off as a procession through the streets of South Queensferry led by a drum band, before ending in the frigid waters of the Forth of Firth. The Loony Dook organisers take safety very seriously, with on-site police and medical professionals. There are also a number of lifeboat members in the water, to help anyone who gets into difficulty. Of course, you have to remember that you are walking across a slippery beach in freezing temperatures and into very cold waters. So you have to be careful of course. South Queensferry is a few miles outside of Edinburgh, so you’ll need to plan your transport accordingly. The easiest way to get here is to drive, and there is free parking with marshals to help you get to a parking spot. Note that it might be a bit of a walk down to the Dook depending on when you arrive. We advise planning for a 10 – 20 minute walk just in case. There is also a train station here, Dalmeny, which serves South Queensferry. Finally, you can also take the bus, or taxis. Many Dookers do it as part of a tour from Edinburgh, so transport is included. 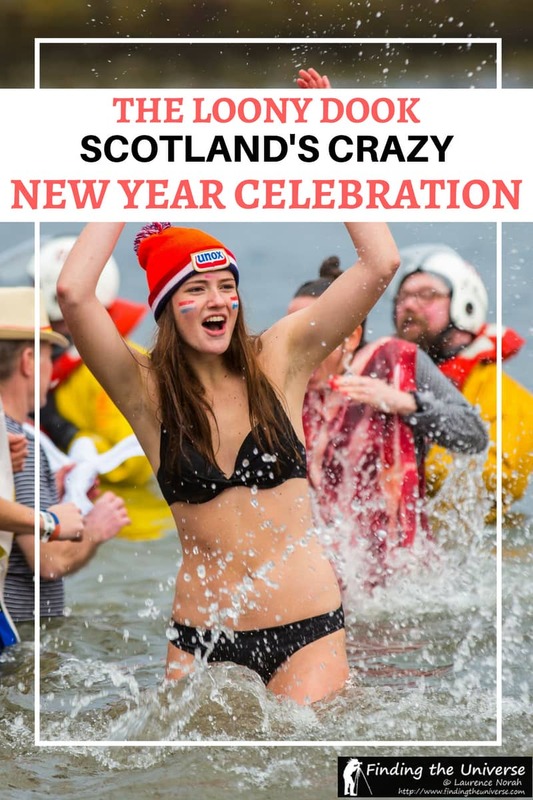 Some tour operators include the Loony Dook as part of their Hogmanay themed tours, and this can be a great option as an overall Hogmanay Scottish adventure. 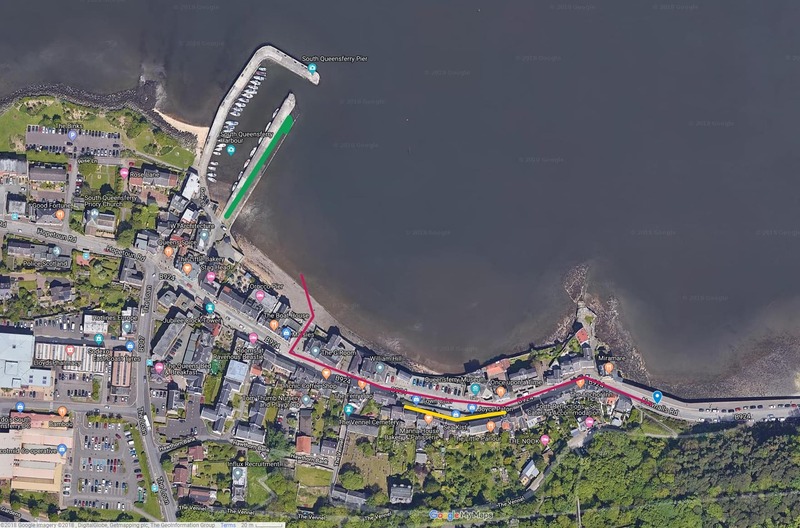 The Loony Dook parade starts on the edge of South Queensferry (here on Google Maps), and the parade of 1,000 people is usually led by a band of musicians. It parades through the town for around 10-15 minutes, and then enters the water around half-way through the town. Most dookers have a quick splash, although some seem braver than others and stay in the water for longer. The parade is fairly long as it has 1,000 people in, so it takes around 20 – 30 minutes for everyone to get in the water and out again. However, the first wave is the most fun to watch going in in my opinion. 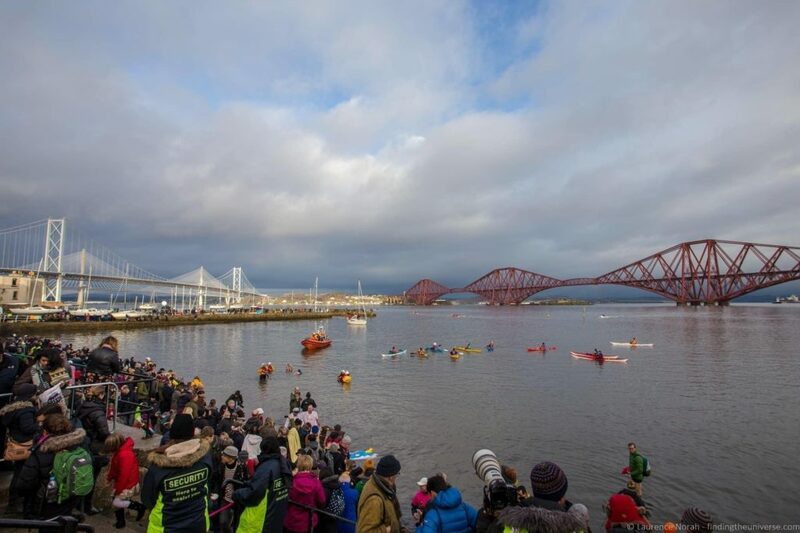 If you’re going as a spectator, one of the best places to watch the Loony Dook from in South Queensferry is the South Queensferry harbour, on the pier. You can see this here on Google Maps. Dookers enter the water down the steps by the Boat House here and spread out along the beach area between the steps and the harbour, and then go into the water. If you want to watch the parade, you can see this from along the B924, the main road through South Queensferry. A good vantage point can be found opposite the Queensferry Museum, where there’s a higher pedestrian area on the south side of the street. Once the parade has passed, you can then head over the street to the car parking area where you can see the beach area and watch the dookers getting wet. Here’s a map image to help you visualise this, which you can also see on Google Maps here. The red line is the parade route, the yellow line is a good viewing area for the parade, and the green line is a good viewing area for the Dook itself. 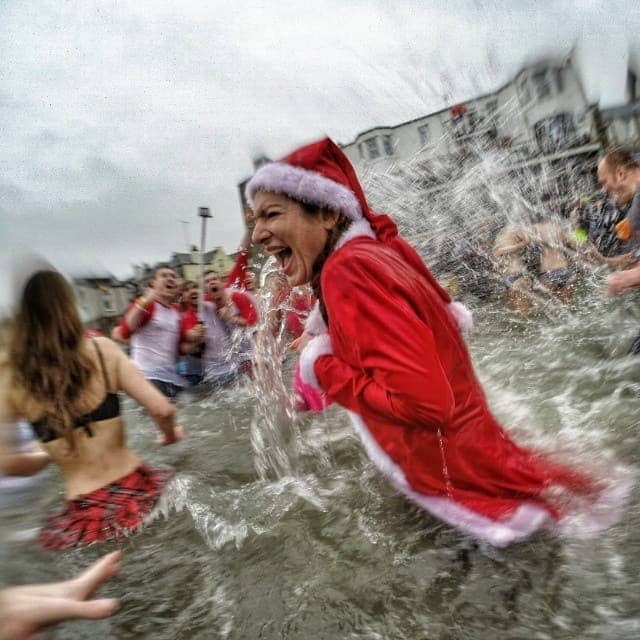 Based on my experience taking part in the dook, I have some tips for taking part in the Loony Doo. First, I suggest having someone else handle your transport – either a tour company like this, or a friend. Next, you’ll want to bring a nice big towel and a bag of dry clothes that someone can give to you shortly after getting out of the water (that friend will come in handy at this point). You’ll also absolutely want to wear some form of footwear, like sandals or old trainers. I did it bare foot, which was a big mistake – the ground in January is very very cold! 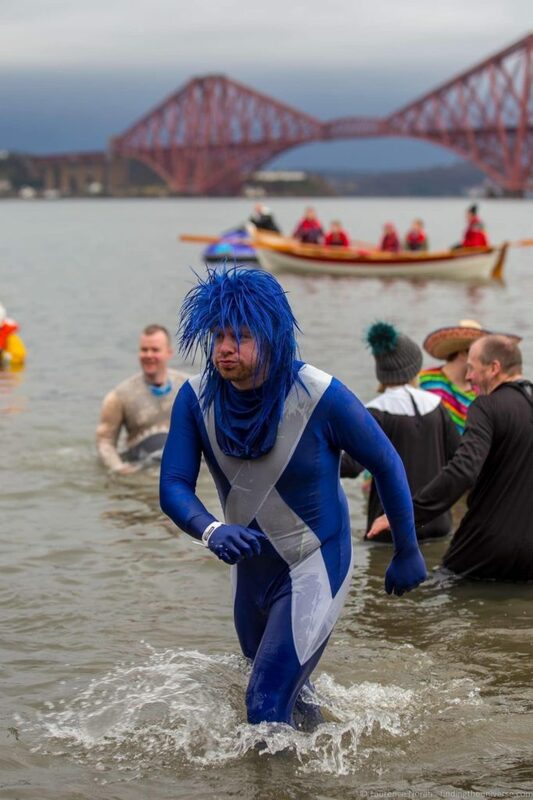 For more advice on what to bring, check out my guide to what to pack and wear for Edinburgh’s Hogmanay, which has a section on the Loony Dook. Other than that, just go planning to have fun! The water is cold, but just throw yourself in without hesitating, splash around a bit, and then find that big fluffy towel. You’ll survive. Before we leave you, we just wanted to share some more resources to help you plan your trip to Scotland, both for Hogmanay, and during the rest of the year. 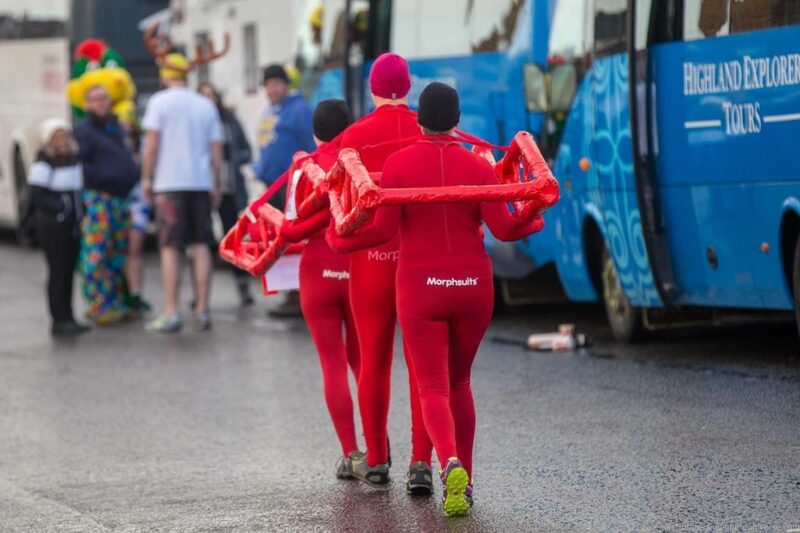 Well, that sums up our guide to attending the Loony Dook in Scotland! Something you want to try for next year perhaps? Let us know your thoughts in the comments below!